This entry was posted in Canadian Politics, Democracy and tagged floor crossing, Liberal Party, Lise St-Denis, NDP by David Taub Bancroft. Bookmark the permalink. I would agree that a ban on floor crossing sounds right in general (with the exception of those who would choose to sit as independents). A case in point that aroused extreme anger and frustration was when David Emerson crossed the floor to the Conservatives. Voters rightfully felt betrayed, that their vote had been thrown out. However, I do admit to moments of glee in other cases of floor crossing. 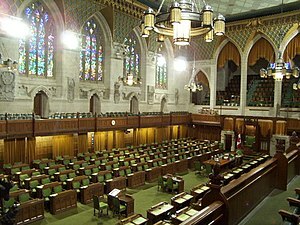 For example when Blair Wilson crossed over to the Green Party, there was much cheering about finally having a sitting Green member in the house – although that did not last long. And I also got a chuckle when Belinda Stronach crossed over from the Conservatives. So I guess that I am as opportunistic as an observer as most politicians are in their decision to cross the floor. Wow, what a partisan! Sheesh! I guess my point is that there ought to be universal rules that apply to all parties — even those I like.